The path to becoming fully “alive” as a leader begins when you define your purpose – your reason for living. 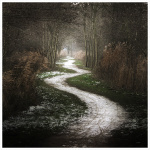 As you get clarity and awareness of your own path you are then able to help others discover and live their own path. Leadership is about pathfinding. In his book Aspire, Kevin Hall breaks down the meaning of the word leader – lea means path, der means to find – a leader is a pathfinder. Someone with vision who can see the big picture and helps others to discover theirs. Discovering your path can be like discovering God (sometimes they can be one in the same), THERE ARE MANY PATHS AND MANY WAYS! Sometimes it is with words, sometimes it is with actions, a fleeting experience, a lifelong journey. At times it is in a flurry of activity and yet other times it is in that moment of stillness when you sit and reflect on your thoughts or you stop thinking all together. Finding your way is not necessarily easy. It requires commitment, desire, and action … it requires a fire within! A fire that burns or at the least … one that used to burn. It may have been reduced to a smoldering ember because you’ve lost your path for one reason or another. Maybe you got side-tracked, maybe you gave up hope, or decided to abandon your path altogether so that you could take the path someone else chose for you … your Mom, Dad, Brother, Mentor, etc. Have you lost your path, are you still looking, could it be in front of you but you can’t see it because your eyes may be closed … don’t give up! What if you were to … rediscover your path … recapture your fire … what if you were to lean into the heat and leaned in so far … that you could not go back! PreviousPrevious post:The Reality of TV … ?NextNext post:How to Bounce Back | Be the Ball not the Egg!